The Parliament is a democratically elected body comprising 129 members known as Members of the Scottish Parliament (MSPs), elected for four-year terms under the additional member system: 73 MSPs represent individual geographical constituencies elected by the plurality ("first past the post") system, while a further 56 are returned from eight additional member regions, each electing seven MSPs. The most recent general election to the Parliament was held on 5 May 2016, with the Scottish National Party winning a plurality. 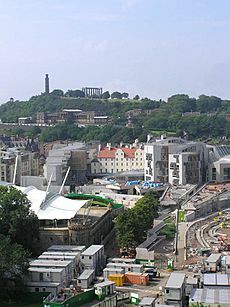 Whilst the permanent building at Holyrood was being constructed, a temporary home for the Parliament was found in Edinburgh. The General Assembly Hall of the Church of Scotland on the Royal Mile was chosen to host the Parliament. Official photographs and television interviews were held in the courtyard adjoining the Assembly Hall, which is part of the School of Divinity of the University of Edinburgh. This building was vacated twice to allow for the meeting of the Church's General Assembly. In May 2000, the Parliament was temporarily relocated to the former Strathclyde Regional Council debating chamber in Glasgow, and to the University of Aberdeen in May 2002. 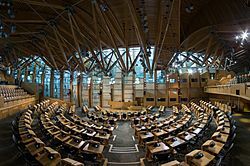 After each election to the Scottish Parliament, at the beginning of each parliamentary session, Parliament elects one MSP to serve as Presiding Officer, the equivalent of the speaker in other legislatures, and two MSPs to serve as deputies. The Presiding Officer (currently Ken Macintosh) and deputies (currently Linda Fabiani and Christine Grahame) and are elected by a secret ballot of the 129 MSPs, which is the only secret ballot conducted in the Scottish Parliament. Principally, the role of the Presiding Officer is to chair chamber proceedings and the Scottish Parliamentary Corporate Body. When chairing meetings of the Parliament, the Presiding Officer and his/her deputies must be politically impartial. During debates, the Presiding Officer (or the deputy) is assisted by the parliamentary clerks, who give advice on how to interpret the standing orders that govern the proceedings of meetings. A vote clerk sits in front of the Presiding Officer and operates the electronic voting equipment and chamber clocks. The next Scottish Parliament election is due to be held on Thursday 6 May 2021. Under the Scotland Act 1998, an ordinary general election to the Scottish Parliament would normally have been held on the first Thursday in May four years after the 2016 election, i.e. in May 2020. This would clash with the proposed date of the next United Kingdom general election. In November 2015, the Scottish Government published a Scottish Elections (Dates) Bill, which proposed to extend the term of the Parliament to five years. That Bill was passed by the Scottish Parliament on 25 February 2016 and received Royal Assent on 30 March 2016, setting the new date for the election as 6 May 2021. Enric Miralles' Scottish Parliament complex in Holyrood Park during construction. The building was completed in 2004. Above and behind the new Parliament is the neoclassical Old Royal High School, which was prepared for a previous devolved Scottish parliament, but never used. 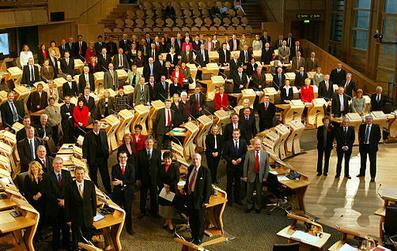 A procedural consequence of the establishment of the Scottish Parliament is that Scottish MPs sitting in the UK House of Commons are able to vote on domestic legislation that applies only to England, Wales and Northern Ireland – whilst English, Scottish, Welsh and Northern Irish Westminster MPs are unable to vote on the domestic legislation of the Scottish Parliament. This phenomenon is known as the West Lothian question and has led to criticism. Following the Conservative victory in the 2015 UK election, standing orders of the House of Commons were changed to give MPs representing English constituencies a new "veto" over laws only affecting England. Scottish Parliament Facts for Kids. Kiddle Encyclopedia.